When I received the news that the AcuRite 01007M Atlas Weather Station was now available to purchase I was very excited. 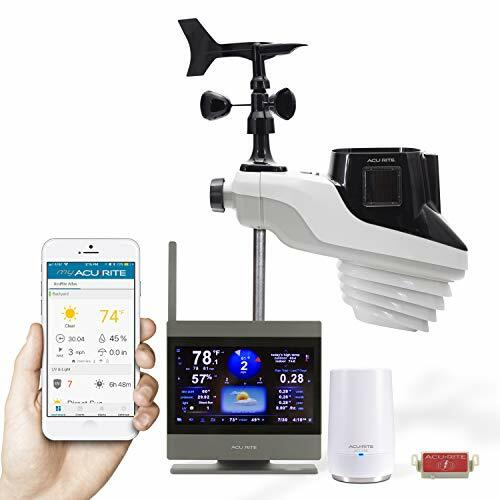 Weather station fans and AcuRite owners have been looking forward to this since January 2017 when AcuRite announced it was developing this new and better version of their best selling 5-in-1 weather stations. AcuRite, the leader in personal weather station technology, is pleased to announce the new AcuRite Atlas environmental monitoring solutions. The initial debut of the AcuRite Atlas family consists of three models of outdoor environmental monitoring solutions – the AcuRite Atlas 7, AcuRite Atlas 8, and AcuRite Atlas Elite.” So this was where the Atlas started, Now it has arrived! In taking a thorough look at the new personal weather station, it is definite that they have made the sensors more responsive to your location. The call it hyper-local. Yes, you can now have some very specific and very accurate readings that pertain very exclusively to where you have the sensors set up. You are no longer receiving and collecting readings that are close, but there are furnished to you with new hyper-accurate weather sensors. As an example, the temperature readings rate out at -+less than 1 degree of accuracy. Wow, that is great. Before the equipment is released it is tested by a select group of weather professionals who actually use and rate the equipment. AcuRite then receives a review from each participant in the Beta Testing. One of the reviewers identifies himself as a professional weather forecaster for over 25 years of service. So as you can see he is impressed especially with this part of AcuRite’s newest release. The Atlas also has new features that track UV exposure, light intensity included in it and you may purchase as a new feature called a Wind Extension. The monitoring Indoor display features many of the new things about this new model from AcuRite. Let’s take a closer look at the facing that you look at in having the AcuRite 01007M Atlas weather station in your possession. It comes with the Touchscreen TFT which makes for effortless setup and navigation. The latest touchscreen technology allows you to enjoy your set up as well, as you personally can see how colorful it is. So let’s look closer now at what you are getting. I will go clockwise around this display facing. As you can see in the middle on the top sits the wind direction arrow and the last detected wind speed. This is monitored every 10 seconds over the 2 minute span. The next larger number is the recorded rainfall for today. It will also give you rainfall rate, accumulated rainfall for the current week, and month, and year to date. As you continue on the bottom going left we have the current time and date that are presented in the lower right-hand side. Next is the indoor temperature & humidity, as well as above it is the one feature I love, a 12-24 hour future animated weather forecast. The settings such as volume, brightness and sleep mode are located on the lower left-hand of the facing…. Going up on the left-hand side is where the dew point is read, the current barometric pressure is read also. The Light LUX reading and the UV rating are shown here as well. Upper left-hand side shows you the current outside temperature as well as the low and high temps for the day. So as you can see many things are available to follow throughout today and daily as you live your life. There are a few more things on the display unit facing as well, but we will not discuss all of them. You may find more information by going to these manuals. Here are the features listed out for you. There are many benefits for you to enjoy. You may also like to know the other ways that you will be able to connect up with your new 1007M Atlas. My AcuRite has free apps and software display which will display your weather information on an easy-to-read dashboard, giving a quick, intuitive view into trends and current details about the conditions that matter most to you. Weather monitoring sensor unit is powered by 4 “AA” batteries either regular alkaline or by using Lithium because it’s better since it’s an outdoor use. The AC Adapter cord is 30 feet (9 meters)for the weather sensory unit. It will transmit as a wireless transmission at 433 MHZ frequency and will transmit up to 330 feet from the display monitor, how well will depend on home building materials usually. ❌ Rain totals are given by event, week, month and year. So some would still prefer a “since midnight” 24-hour total. At the initial phase of a new launch, the new Atlas appears to be very competitively priced and It looks like a step up from other models from AcuRite, and other manufacturers. It is a bit below the quality of a Davis Vantage Pro but promises to be a step up from the more elite Pro 5-in-1 series from AcuRite. Please refer to these reviews we have done of these other weather stations. 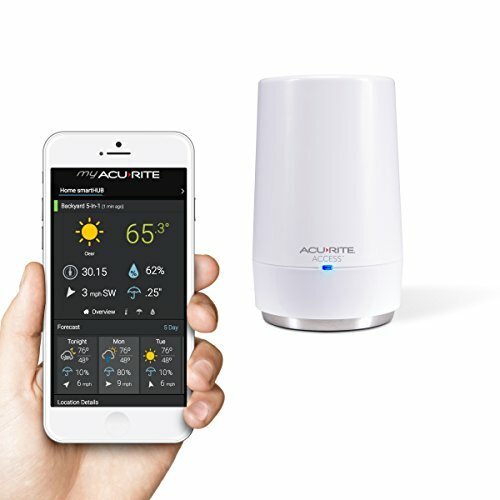 This review article is a look at the AcuRite 01512 Pro Color Weather Station. As one does more and more inspection of climate stations, they fine that most manufacturers build a series of stations that are very similar to each other. The AcuRite 01007M Atlas Weather Station is brand new. It has just been released by AcuRite. We take a closer detailed look at what the weather station brings to the Weather Fan. We take a detailed look at the new features never seen before.